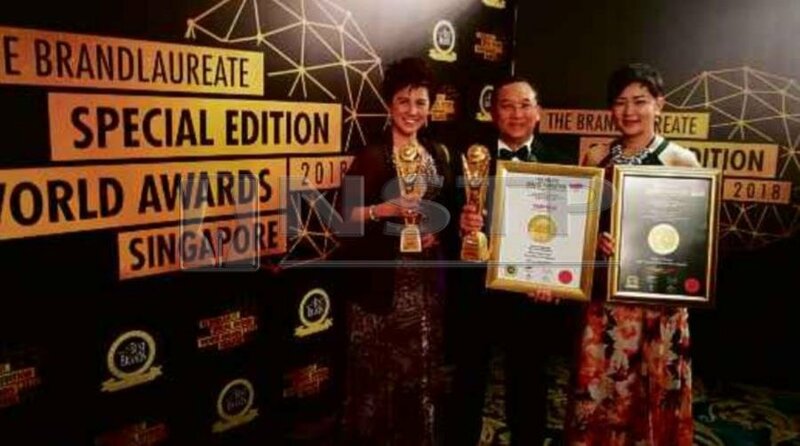 Mah Sing Group Bhd group managing director (centre) Tan Sri Leong Hoy Kum has scored a hat-trick of Lifetime Achievement Awards at The Brand Laureate Special Edition World Awards 2018. STIMULATING the property industry should have a larger impact on the wider economy, says Mah Sing Group Bhd group managing director Tan Sri Leong Hoy Kum. He lauded the government’s continuous efforts to promote home ownership, especially for first-time buyers. Leong said the introduction of the National Housing Policy and new initiatives would benefit house buyers and address the demand for affordable homes. Last year, Mah Sing embarked on its “Reinvent Affordability” campaign, covering four projects namely M Centura in Sentul, M Vertica in Cheras, M Vista in Penang and Fern phase 2 in Meridin East, Johor. Moving forward, Leong said Mah Sing would continue to enhance the lives of its customers by developing accessible and well-planned products. Leong hopes the government will consider several other measures, such as relaxing lending guidelines for housing loans. “It has been challenging for the local property industry for the past few years, especially with the loan eligibility issues. We understand that the government is working together with Bank Negara Malaysia on relaxing lending guidelines to enable more first-time buyers to secure housing loans. “We hope this issue will be addressed, providing higher margin of financing, longer loan tenure, lower interest rates, higher Debt Service Ratio and discounted MRTA (mortgage reducing term assurance) to ease home ownership for the first-time home buyers,” he said. In the 2019 Budget, Leong hopes the government will continue to exempt stamp duty expenses for first-time buyers and extend the incentives to affordable properties below RM500,000. He said the current exemption of 100 per cent stamp duty for first property priced up to RM300,000 is a good move to lessen the burden of first-time buyers. “However, the initiative could be extended to first property under RM500,000, taking into account the affordable prices in the main cities of Malaysia. This was a successful stimulator for property transactions in the past and would be an effective short-term catalyst to stimulate the industry,” said Leong. Leong also hopes the government can start a campaign that involves the collaboration of all stakeholders, such as bankers, lawyers and developers, to come up with a strategic plan to encourage home ownership, especially for affordable houses, to help reduce the unsold stock in the market. Meanwhile, Mah Sing was recently honoured with two international awards at The Brand Laureate Special Edition World Awards 2018. It won the Most Visionary Property Developer and The Brand Laureate World Brandpreneur Hall of Fame - Lifetime Achievement Award. The former signifies Mah Sing’s unceasing efforts in transforming the property industry, while the latter acknowledges the outstanding achievements of Leong, who is also the group’s founder. “These awards highlight the hard work and effort the Mah Sing team has invested in improving and transforming the industry, which in turn has strengthened our brand presence in Malaysia,” said Leong.